Are you ready for the call of the YETI? When was the last time you had a great adventure in the wild or for that matter an outdoor adventure in the city? Life is short, so being ready for that adventure call or city escape is what it’s really all about.Yeti's hard and soft coolers perform from the back country to the backyard, to the ball field and everywhere in between. If you’ve been noodling the idea of paddling the wilds of Wabakimi, camping in Algonquin Park or doing a season of local ballpark visits than it’s Yeti time. Every cooler must carry the day, whether in the wild or the blistering heat of a backyard. The YETI brand was built on the legendary durability and ice-retention capability of the tundra. Keeping food colder than cold, ice that stays ice, being leak proof and as tough as nails is what YETI is all about. YETI products are as tough as nails because YETI uses materials found in things like HazMat suits and whitewater rafts. Trust your YETI hard or soft cooler to outperform at every opportunity. 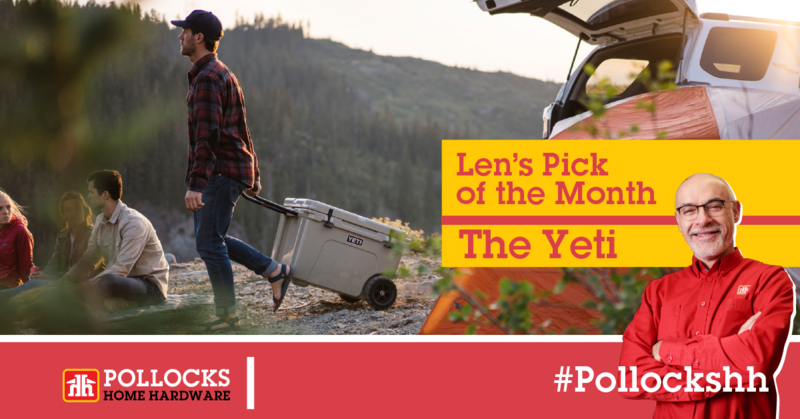 YETI not only builds hard and soft coolers, but drinkware, bags, buckets and chairs for adventures requiring gear that performs on land, sea and in your backyard. YETI has the baddest coolers in the land, tougher than even your Mother-in-law’s fruitcake. Buy one and own it forever! For Len's Pick of quality and innovative products for your home, choose any of the following and learn more. To subscribe to our email updates, simply provide your email address, first name and postal code. We'll send you customized deals based on your location or store of preference. You can unsubscribe, at any time, with an email sent to contactus@homehardware.ca.